Only one national dish could make 230 million people of many ethnicities spread across 17,000 islands happy: nasi goreng! Nasi goreng literally translates to "fried rice", and is uniquely Indonesian. It's worlds apart from the Chinese-style fried rice found throughout the rest of the world; for starters, orange-colored nasi goreng contains a light blend of chili and other spices. Regardless of upbringing or financial background, people across Indonesia eat nasi goreng regularly. You can find woks sizzling with nasi goreng at the simplest of warung Indonesian street food stalls and on the most expensive menus in fine restaurants. Although cheap and easy to prepare, nasi goreng was seen fit to serve to President Barack Obama during his 2010 visit to Indonesia. Although travelers in Indonesia typically end up eating their weight in nasi goreng before branching out to try other local dishes, they all inevitably begin to miss the flavor once home. Pronounced NA-see GOH-reng, nasi goreng had the same beginnings as other versions of fried rice: as a safe, delicious way to avoid wasting the precious staple food. Unknown to many, old rice is far more a threat for food poisoning than spoiled meat. Bacillus cereus - a bacteria once considered for biological weapons - can form on rice kept at room temperatures. A lack of refrigeration in Indonesia means that rice is often prepared in bulk, then kept in large tubs; frying the rice prevents the need to throw out precious food. Aside from safety, nasi goreng fits well within the typical eating style in Indonesia. Food is often prepared early in the day, then covered and served at room temperature later so that people can eat when their work schedules allow. Nasi goreng left over from dinner is often consumed for breakfast the following day. Presentations of nasi goreng vary from place to place. Street stalls may serve up only the rice eaten with a plastic spoon, but restaurants add a variety of garnishes around the plate depending on price. 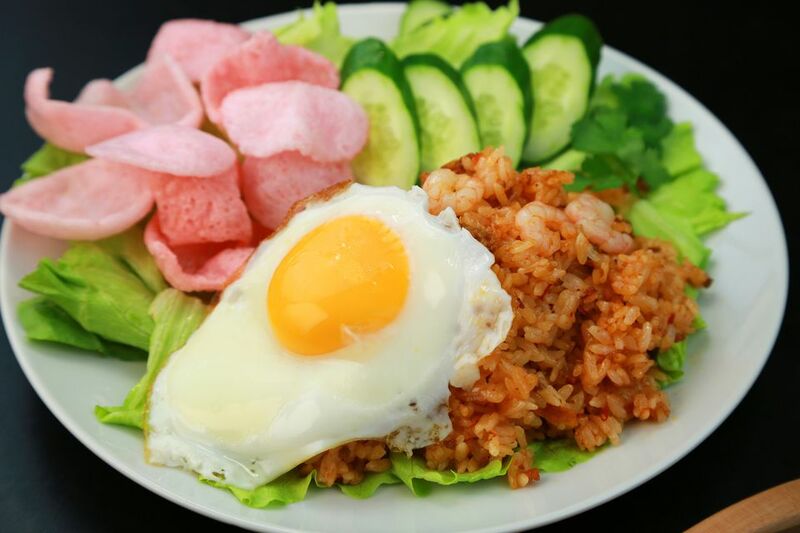 Nasi goreng in a restaurant is typically served with slices of cucumber, tomato, and an airy krupuk shrimp cracker. Nasi Goreng Special: Typically available as an upgrade even if not on the menu, nasi goreng "special" simply comes with a fried egg on top. Nasi Goreng Ayam: Nasi goreng ayam includes a piece of fried chicken. This isn't your regular, Kentucky-style fried chicken; Indonesian fried chicken is cooked in a mix of spices (bumbu) unique to the locality. Nasi Goreng Gila: This street-food fried rice can be found served after dark around parts of Jakarta. Translating to “crazy rice”, nasi gila may refer to how crazily all the ingredients are mixed up – beef sausage, scrambled egg, meatballs, leeks, onions, and whatever the vendor chooses to include! Nasi Goreng Ikan Bilis: Popular in Flores where the Komodo dragons live, nasi goreng ikan bilis contains small, dried anchovies. Nasi Goreng Udang: Nasi goreng udang is served with prawns. Nasi Goreng Cumi-Cumi: Pronounced "choomy-choomy," this nasi goreng is served with squid. Nasi goreng, despite being cooked with chili powder, is typically not spicy. Restaurants offer different types of spicy sambal (chili sauce) upon demand. Sambal comes in many different forms - taste or smell it first! Some sambal variations are based on fermented fish or shrimp paste while others contain lime juice or sugar. Asking for your nasi goreng to be prepared "pedas" will really increase the heat; diced chili peppers will be added to the wok while cooking! Nasi goreng can be prepared fairly easily at home. Pastes and flavor packs for quick nasi goreng can be purchased in international supermarkets, however the dish is not difficult to prepare from scratch. To achieve the real texture of nasi goreng, use rice that was cooked and refrigerated from the night before – dry, al dente rice is best. Nasi goreng can be prepared without the belacan shrimp paste, but the taste will not be as authentic. Have all ingredients ready to go; nasi goreng cooks quickly once started and must be mixed continuously! Warm one tablespoon of oil on low heat in a wok. Cook the paste first until it becomes thick and brown. Add an additional tablespoon of oil along with the rice; fry on high heat while mixing rapidly for an even consistency. Spoon in water if the mixture begins to get too dry. Remove the rice from the wok, add another spoon of oil, and carefully fry an egg to be draped on top of the nasi goreng. Garnish with cucumber slices, tomato, pickled vegetables, or cilantro.